Wow, it's Friday again. What are you doing for the weekend? Are you going away, or enjoying a quiet one at home? For me, it will probably be a quiet one at home, but I am looking forward to it so that I can bake and read and watch movies to my heart's content. 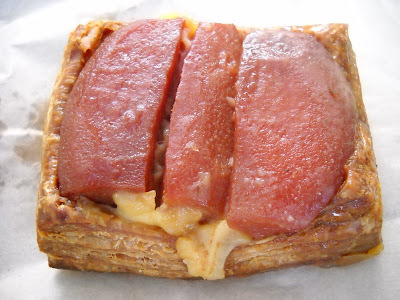 This week's French Friday with Dorie is the Carmen Miranda of recipes - the citrus berry terrine. 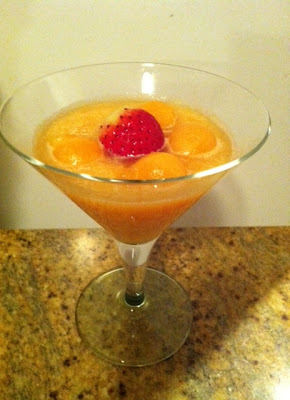 The dish is comprised of berries, orange and grapefruit segments set into a fruit juice jelly - I used a combination of yellow grapefruit juice and Taylor Lee mandarin juice, as this is what I had on hand. I have to say I was over juicing grapefruit by the end of it - it took a lot of grapefruit to get to one and a half cups, which is when I switched to mandarins for the remainder (and these were much easier to juice with a greater yield). I used thawed frozen berries because it is winter here. The end result tasted better than I thought it would - it was not at all sour, despite the grapefruit juice content (although I upped the sugar from 1/3 cup to 1/2 cup). However, it being winter, I didn't want large quantities of this jelly, and took it to work. The recipe says to semi-set your jelly for 2 hours before mixing in the fruit segments and berries - by that time, instead of an egg white consistency, I had scrambled egg consistency. I plugged on because I wasn't starting again, and it worked out fine, although I couldn't pour my jelly onto the fruit - I had to mix it all about. Verdict - this looks pretty, but didn't grab me taste wise. 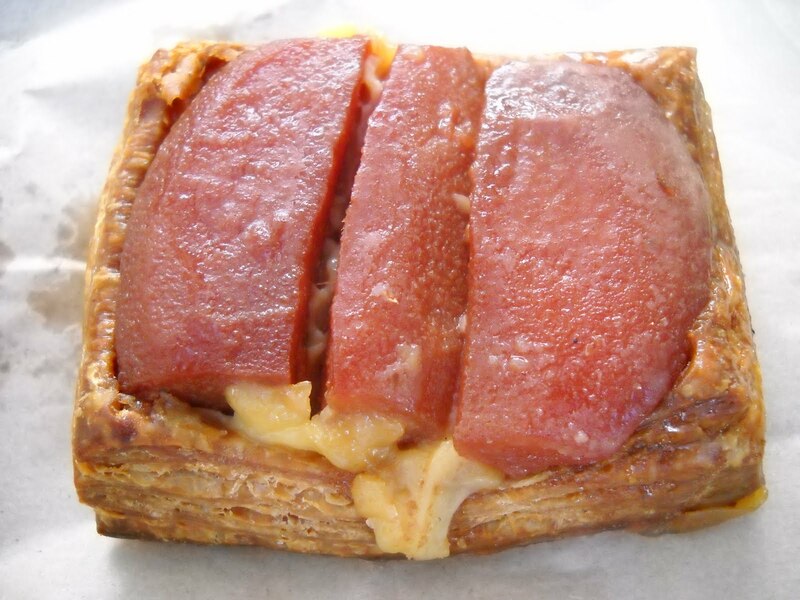 To see some other thoughts on the citrus berry terrine, visit the LYL section of the FFwD website. Recently, I ordered a box of fruit and veg from Aussie Farmer's Direct, just to try it out and see what the service was like. I was quite happy with the selection that I received, the only drawback being that it was quite a lot for one person. One of the items in my Aussie Farmers fruit and veg box was a butternut pumpkin. I adore pumpkin of all varieties, but sadly, my poor butternut pumpkin lay neglected at the back of the fridge for a few weeks, and was in a rather sorry state. I was loathe to throw it out, and was rescued by a recipe posted by fellow Melburnian, Johanna of Gourmet Green Giraffe, who posted a delicious looking Spicy Pumpkin Tea cake recipe. This cake is one of those great recipes that are fairly healthy and guilt free for a cake, so I happily made this one. You can find the recipe here. This tea cake was flavoursome and delicious, even without butter or icing on top, and surprisingly moist given the absence of milk. Much of the moisture comes from the pumpkin itself. The cake went down like a house on fire at work too, so it must be a good one. Thanks to Johanna for sharing this family recipe - I will gladly make this again. I joined The Daring Bakers way back in January 2008 because I was keen to attempt some of the gorgeous desserts and cakes that they were making. Regular readers of my blog know that I am a sucker for a pretty yet tasty cake, so it will be of no surprise to you that I adored this month's Daring Bakers challenge - the Fraisier. Prior to this challenge, the only "Frasier" I had heard of was the wise-cracking psychiatrist of the same name played by Kelsey Grammer in the long-running US TV series of the same name. However, this Fraisier is a far tastier dish, comprised as it is of two layers of chiffon cake, filled with a custard cream and strawberries ("les fraises" in French, and I imagine the origin of the name of the cake). I made my Fraisier straight down the line - a vanilla chiffon cake, with vanilla custard cream and strawberries. The recipe for the challenge had almond paste on top, but I am not a fan, and instead dusted the top of my cake with icing sugar. I didn't have an 8" springform pan, so I lined the sides of an ordinary cake tin with a false bottom with acetate. This meant that it was difficult for me to get my cake out as cleanly as I would have liked, but I think it still looks pretty good - I would buy it if I saw it in a shop. This cake got a pretty good rap at work too, so I was overall happy with the result. Thanks to our host Jana for choosing a challenge that is just my kind of dessert - she will have the recipe. To check out the infinite variety of Fraisiers put forward by the Daring Bakers, check out the slide show at The Daring Kitchen on 27 July (US time). On Saturday afternoon, Seven Two rescreened the last ever episode of the seventies British sitcom, Man About the House. Although my family are fans of this show, having seen endless reruns over the years, I had never previously seen the final episode, in which one of the female housemates, Chrissy, gets married - thereby destroying the premise of the show of two girls and one guy flatting together. I enjoy watching this show as much for the fashions of a now-bygone era as the nudge, nudge, wink, wink repartee. When Chrissy married Norman, the older brother of "the man about the house", Robin, the day had a mostly chocolate flavour about the fashions. Chrissy wore a cream floral peasant blouse with a cream and brown skirt; Robin wore a cream suit with a dark chocolate waistcoat; and the groom wore a dark chocolate brown three piece ensemble. These items of clothing would be the stuff of children's dress-up boxes today, but back then (circa 1976), I assume they were the height of fashion. This brings me onto this week's choice from Steph of A Whisk and A Spoon for Tuesday with Dorie - namely, Creamy Dark Chocolate Sorbet, of a hue the same colour as Norman's suit in the final episode of Man About the House. I wasn't sure what to make of this recipe - a chocolate ice confection with no cream and minimal milk, and added water? At first, it seemed grainy in the pan, and the words "uh oh" went through my head, but ultimately, this came good, and it turned into a rather tasty treat. I prefer creamy chocolate icecream hands down, but if you want something that is a little less naughty nutritionally (but not much less - there is a lot of chocolate in this), then Dorie's chocolate sorbet may be the treat for you. 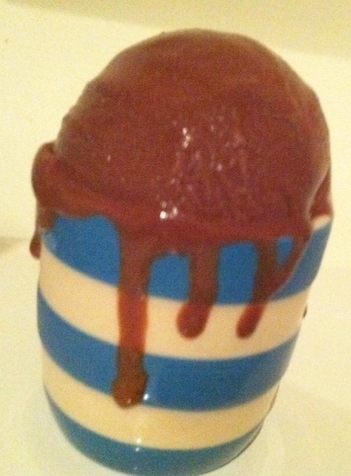 I served a scoop of sorbet in a gorgeous Cornishware egg cup - I have been eager to use an egg cup ever since I bought a set of them, and now was my chance. Even though it is quite cold here, it took no time at all for the sorbet to start to melt, but I thought the drips down the side of the egg cup looked rather artistic. The lighting is bad because it gets dark very early on here, but I had no other time to take a photo, and the lighting is generally pretty poor in my rented flat - but you get the idea of the deep chocolate colour of this sorbet, which is indicative of its flavour. Thanks to our host this week, Steph - she will have the recipe, or get your hands on Dorie's book, Baking From My Home to Yours. To check out what the other Doristas thought of this sorbet, visit the LYL section of the TWD website. Ages ago, I bought some chestnut flour from Mediterranean Wholesalers in Sydney Road, with no clear idea what I was going to do with it. Tuesday with Dorie came to the rescue with this week's recipe, which was chestnut scones, but I noticed that my flour expires in September, so I am going to have to make a bit more than a batch of scones to use it up in time. Nancy of The Dogs Eat the Crumbs mentioned that she had made a chestnut pound cake, which I thought sounded rather nice. 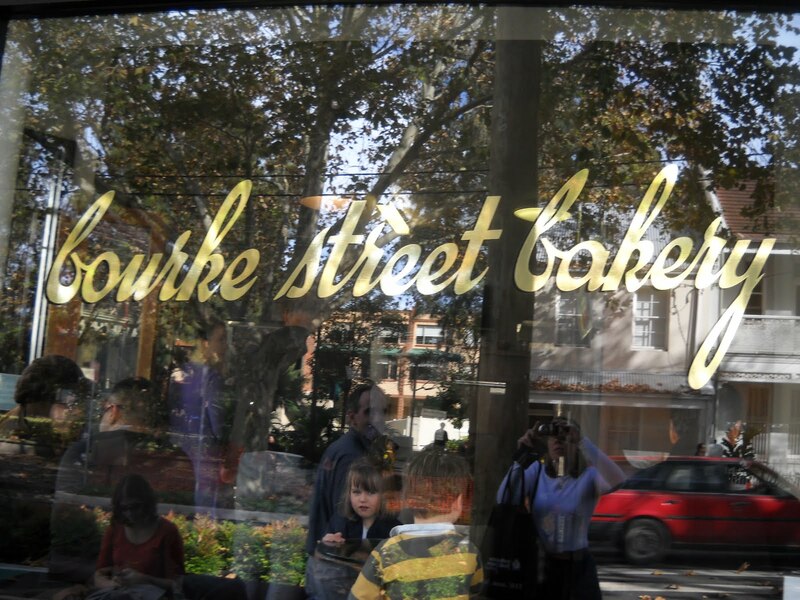 After a quick Google search, I found a recipe for Alice Medrich's Chestnut Pound Cake here. This is a pearl of a cake. Not only does it contain chestnut flour, but it is also laced with rum. How good does that sound - a rum toddy and hot chestnuts in front of the fire experience in cake form. The crumb of the cake is moist and dense, and it tastes sensational without any adornment whatsoever. The rum flavour is evident, though not strong. If you are lucky enough to run across some chestnut flour, do make this cake - it tastes wonderful, and is so easy to make, giving it top marks in my books. This week's French Friday with Dorie challenge sweeps us away to the tropics - perhaps to New Caledonia or some other French colony where the palm trees sway, the ocean is blue and life is good. Ahhh .... now where were we? That's right - back to reality. The dish is coconut lemongrass-braised pork, which has a definite Asian influence. It is a type of pork stew, whereby cubed pork is braised in coconut milk infused with lemongrass, turmeric and various other spices. What I liked about this dish is that it was warm and filling - terrific for winter. What I didn't like that much was the coconut milk, which made it a little bland. Oh well - it was OK, just not one I will make again. To see more coconut lemongrass-braised pork, visit the LYL section of the FFwD website. This was Janet's first Swans game in two years, so it was a special occasion for her. 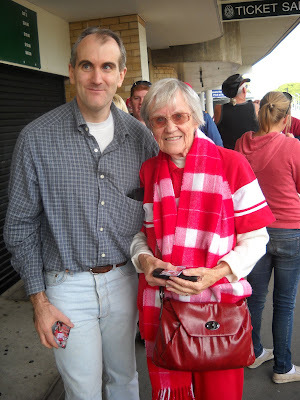 Unfortunately, things didn't go to plan on the day, and the Swans lost to Hawthorne. 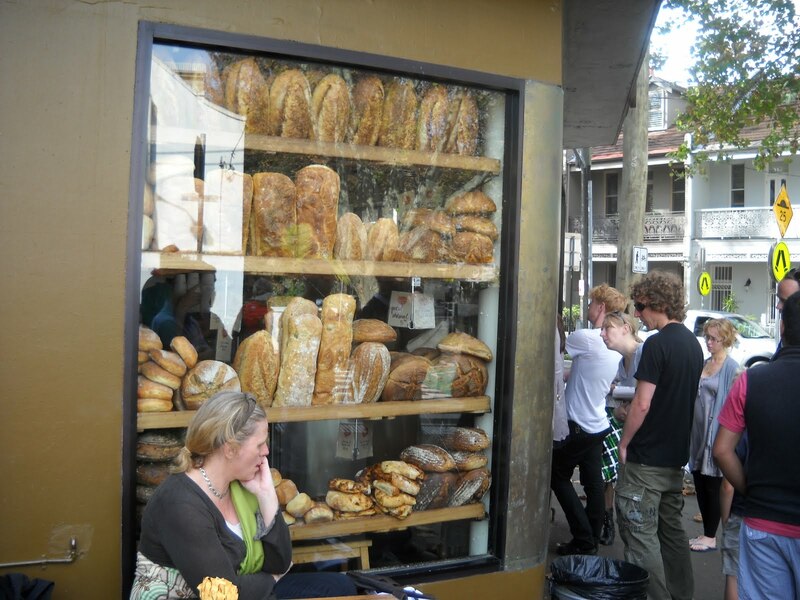 Look at all the divine bread in the window! 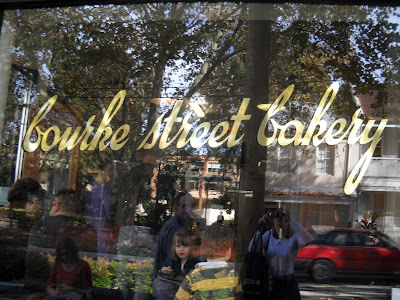 The Bourke St Bakery is tiny as far as floor space goes, and there is very limited seating inside and out, so your best bet is to buy take-away. However, as with presents, size is not in direct proportion to how wonderful a place is, and the longish queue to get in was an immediate sign that this bakery was worth waiting for. The pastry was flaky and melt in your mouth, and the Middle Eastern flavours of the sausage roll somehow just worked - I loved it! Tim had a pie, which he said was very nice although very messy to eat. 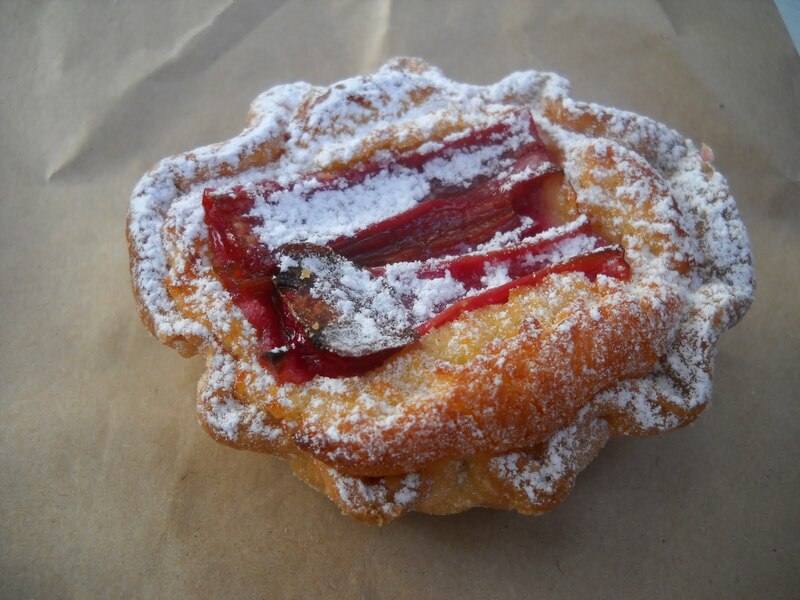 It comprised slices of ruby red, poached quince, sitting atop a light pastry cream and a thick puff pastry raft. It was superb! Tim assures me that this tart was also a winner. The Bourke St Bakery is rather out of the way in a primarily residential area, and as mentioned above, is not generally a place with space for you to sit and linger, but it is definitely worth the effort to seek it out if you are in Sydney and try some of their baked delights - or buy the Bourke Street Bakery cookbook and bring it home to you. Next time, the bread is on my agenda! This week, it's more scones on Tuesday with Dorie. Andrea of Andrea in the Kitchen selected Dorie's Chestnut Scones. These scones were my favourite to date, as the chestnut flour gave these scones a subtly unique flavour that you would never identify if you didn't know what was in the scones. I served these scones with raspberry jam - a delicious taste combination. To check out some more chestnut scones, visit the LYL section of the TWD website. Andrea will have the recipe, or buy the book. Not for the first time, I was hesitant about this week's French Friday with Dorie dish. Cold fruit soup? Even in summer, I'd never order this at a restaurant. Basically, this dish is rockmelon pureed with grated ginger and salt, and topped with rockmelon balls and strawberry - I skipped the mint. I found the combination of ginger and rockmelon rather strange, and this just wasn't my thing. Go visit the LYL section of the FFwD website to see what others thought of this recipe. This week's Tuesday with Dorie challenge was cream scones, chosen by Lynne of Cafe LynnyLu. I brushed the top of my scones with milk to make them golden, but you don't have to. My scones were served on this very glamorous plate from the cupboard at work slathered with apricot jam or lemon curd (depending on which ones you got). Thanks to Lynne for this week's pick - she will have the recipe. And check out a bunch of cream scones at the LYL section of the TWD website. 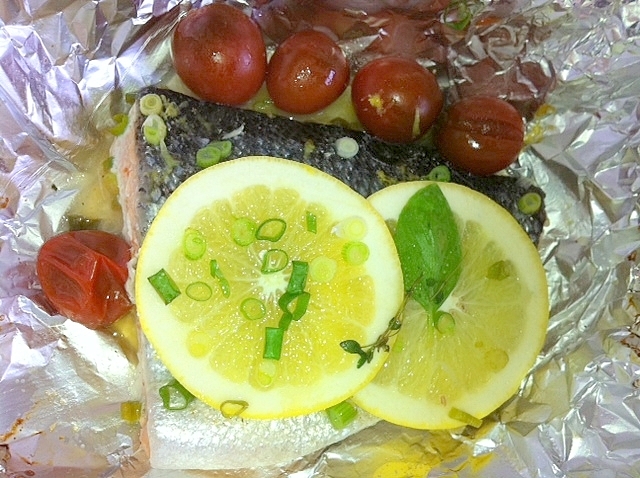 This week's French Fridays with Dorie recipe is Salmon en Papilotte. Basically, it's fish and tomatoes cooked with herbs and citrus in a foil bag in the oven. I am no stranger to this type of cooking - Jamie Oliver showed me years ago back in his Happy Days as the Naked Chef how to do this with chicken and fish, and I have done so many times with great success. At least this week I knew I'd like the end result. I substituted the lemon for grapefruit (because I still have quite a few of Jan's grapefruit to use up), and used kumatos instead of grape tomatoes, but otherwise followed the recipe. This week, I even tracked down basil. This was a delicious meal, although rather expensive because salmon fillets are pricey. As mentioned above, this type of cooking can also be done with chicken, and you could use basically any type of firm white fish fillet. There should be a plethora of salmon and tomatoes en papilotte for you to admire at the LYL section of the FFwD website. We might be nearing the end of our Tuesdays with Dorie adventure, but there are still some really good recipes that we haven't made yet. Case in point - this week's Chocolate Chunk Muffins, chosen by Bridget of The Way The Cookie Crumbles. These muffins are rich and chocolatey and more cake-like than muffin-like because they are relatively light in texture. This made me like them even more. However, they need more chocolate chunks - the amount suggested was a tad on the scant side. What's not to like about a chocolate muffin containing chocolate chunks? Thanks to Bridget for this week's selection. 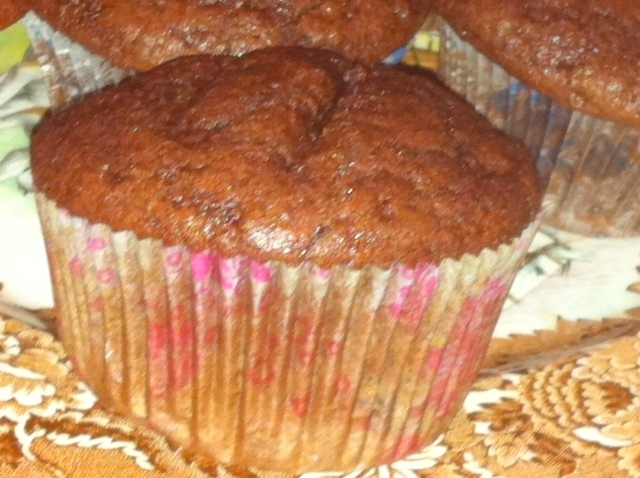 Visit the LYL section of the TWD website to see what everyone else thought of these muffins. Last week on Masterchef, Billy of A Table For Two faced off for an immunity pin against Merle, a country cook who has been baking for 70 years. The recipes they made were cupcakes and a Peach Blossom Cake, a la country show style. I couldn't resist making the Peach Blossom Cake - isn't the name itself just gorgeous? A Peach Blossom Cake is a white and pink marble cake with pink icing to match the colour of the pink in the cake. You can find Merle's recipe here. For country show level baking, there are a whole bunch of rules and regulations that go with making this cake; I didn't worry too much about those, as I was more interested in the cake itself. I was particularly intrigued with Merle's method for getting an even marbling throughout the cake. 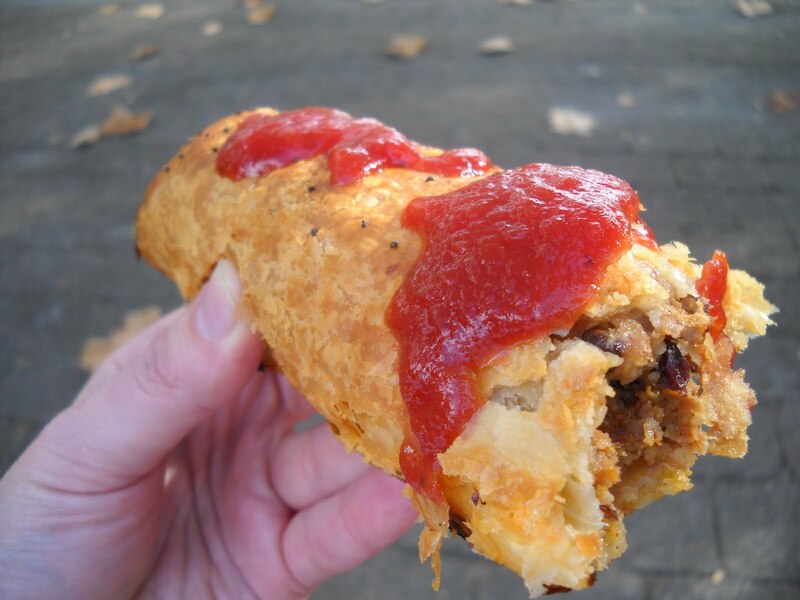 Thanks for sharing your recipe with us Merle. The method for marbling will come in handy for future cakes and cheesecakes - can't wait to try it out again! 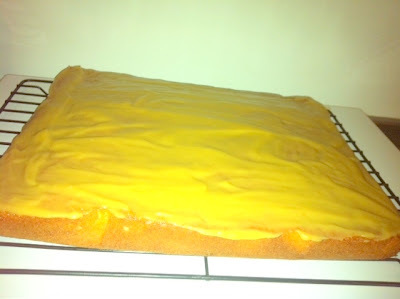 Recently, I saw that Emma of The Cake Mistress had posted a recipe for a Ginger Fudge Cake on her site. Now "ginger" and "fudge" have to be two of my favourite things ever and I couldn't resist making this cake. The cake is a ginger sponge, and it is topped by caramel/toffee icing. You have to work fast with the icing because it sets up rather quickly once removed from the heat. The flavours of this cake and its catering perfect size made it ideal for taking to work - I just had to be careful to ensure that the toffee icing didn't touch anything, because it also sticks to everything and comes off if you aren't careful. For this reason, I recommend cutting the iced cake with a knife that has been dipped in hot water - the icing sticks to the knife too. 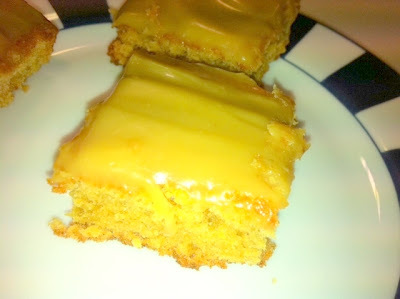 Loved this cake - if ginger and caramel are your thing, then this cake is a must. I love quince - the only thing which puts me off is their hairy thick skins and difficulty to cut prior to being cooked into ruby, yielding beauty. I recently made quince and orange jelly; with the remainder of my quince, I peeled them, cut them into sections, and roasted them with butter and honey in accordance with the directions here. 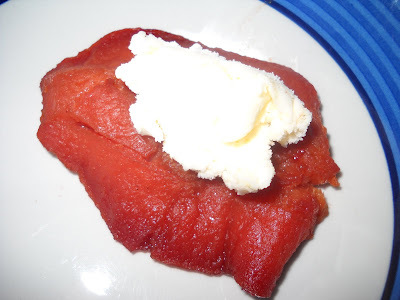 I then served the roasted quince with a spoon of quark. How was this dessert? Sensational! The preparation of the quince, though not exactly easy, is well worth the effort. I urge you not to be scared by quince, no matter how unfamiliar they are to you (and they were to me until this year). They are a very special fruit, which look so homely on the outside, but once their true colours are revealed, will win your heart. 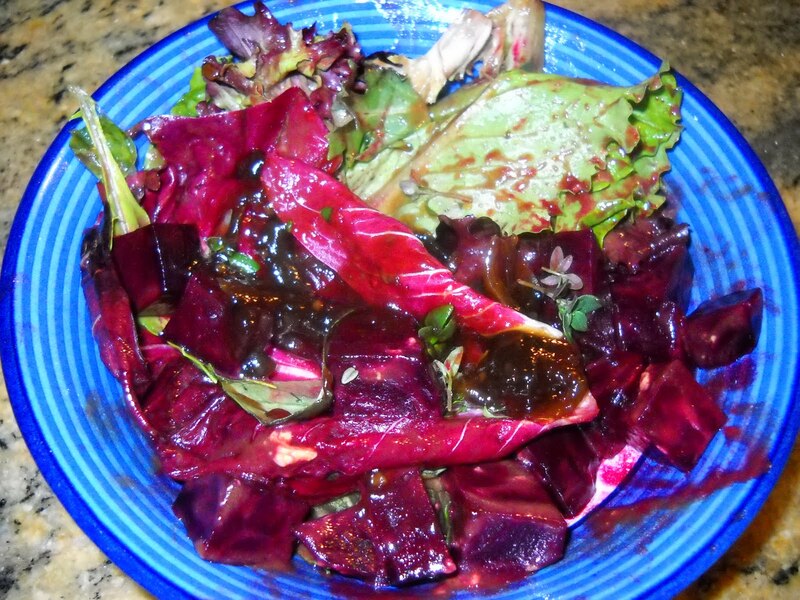 This week's French Fridays with Dorie challenge is Chunky Beets and Icy Red Onions. However, I hate raw onion, especially red onion, so I took Dorie's bon idea and made my salad with roasted beets, salad greens, caramelised onions (out of a jar), vinaigrette and fresh thyme. I am not a huge salad fan ever, and even less so in the middle of winter. I have to admit that this tasted OK (I am a fan of beets), and did surprise me - but not enough to make it again. Go visit the LYL section of the FFwD website to see what the other members made of this salad.